December 7, 2011 February 14, 2018 P.O.P. It’s hardly surprising that members of the corporate plutocracy and their accomplices in government and media should smear Occupy Wall street at all costs. What’s especially impressive, however, is that they’ve convinced so many far less wealthy citizens to be water carriers in their propaganda assault. Many people (including, no doubt, people you know and hear from frequently) seem to have made a full-time career out of attacking OWS, and within that profession there is a dominant specialty of comparing it unfavorably to the Tea Party. One common theme you’ll hear is the claim that while the TP is a genuine grassroots movement, OWS is an astroturfed frankenstein formulated by a large subversive organization and passed off to the rabble to do its bidding. Perhaps the appropriate response to this is: sort of; maybe; yes; no; not really. It’s true that the Tea Party had rather humble beginnings, with a few sparse gatherings of citizens protesting high taxes and “big government”, whatever the hell that means. But it likely would have remained tiny and insignificant had it not been quickly co-opted by the Republican Party, the corporate media and megabusiness interests- the very people, in other words, largely responsible for the very grievances that inspired both OWS and TP. OWS, on the other hand, started out as a grassroots movement and has remained that way. This, of course, contradicts the common belief that it is the creation of the iconoclastic magazine Adbusters. But Adbusters merely supplied the inspiration, not the blueprint, and took no real steps toward making the suggestion a reality. That task, from the beginning, has been the handiwork of a leaderless mass of ordinary citizens. It’s about as close to a genuine grassroots phenomenon as it’s possible to find these days. Among the major string-pullers of the Tea Party are the Koch brothers, billionaire corporatists who are obsessed with destroying Barack Obama, whom they consider “the most radical president in the nation’s history.” (Presumably, they say this with a straight face.) Consequently, they’ve poured millions of dollars into promoting the Tea Party and also were instrumental in organizing it. This fact is often overlooked, yet many people claim that another billionaire activist, George Soros, has done the same for Occupy. Hardly surprising, since he’s accused of having a finger in every pie that comes out of the oven if it tilts even one iota to the left. (You haven’t lived until you’ve watched this video, in which the excruciatingly embarrassing Victoria Jackson, who led a Tea Party assembly in chanting “there’s a communist living in The White House”, even maintains that Soros owns Snopes, which apparently has debunked some of the other batty ramblings she’s made.) But there’s no indication that Soros has ever donated even one penny to Occupy Wall Street. So what we have here is a sort of double standard compounded by falsification, right? Actually, make that a triple standard. Because good old Michael Moore, one of the favorite bugbears of the reactionary set, also gets dragged into the picture quite frequently. Not just because he’s a prominent presence at Occupy events, nor because he’s funded OWS himself, but because he hasn’t. Yes, you read that right: the same folks who ignore, downplay or deny the financial contributions of the Koch Brothers to the Tea Party and demonize George Soros for funding OWS when he really hasn’t also demonize Michael Moore for NOT doing likewise. Is your head spinning yet? Not only do they seem to believe that Moore should assume fiscal responsibility for the movement itself, but for everyone participating in it. Hey, if they’re hurting financially and he’s so successful, why doesn’t he just turn over his cash to them? It’s a subtle way of suggesting that the protesters are all just lazy bums looking for a handout, an assertion that many people make with far less subtlety – often adding the glib recommendation that they “get a job”, and then they’ll have no reason to complain. But probably the most common meme about OWS demonstrators is that they’re disruptive and violent – two words which the detractors apparently believe to be synonyms. And this behavior is in stark contrast to Teabaggers, who all conduct themselves like perfect angels. Well, except maybe for the occasional spitting on a black congressman. Or manhandling a woman peacefully displaying an opposition sign, throwing her to the ground and stomping on her head. You know, paltry things like that. But those Occupants – holy Hannah. Mass arrests. Camping out in public. Littering. Even a couple of sexual assaults. Maybe even an occasional singing of “Kumbaya”. They must really be the scum of the earth, right? This CBS affiliate video, which went radioactive on the Internet, even purports to depict them terrorizing a group of school children. What it actually reveals is a blistering self-indictment on the part of the CBS station, and an iconic illustration of the general tone of media coverage of OWS. Watch the video carefully. 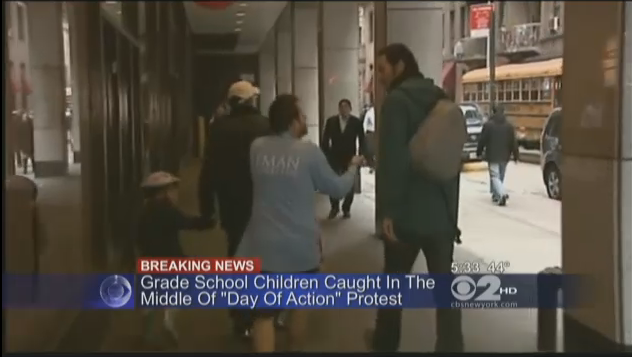 Do you see ANY sign that ANY protester is yelling at ANY kid? Sure, there’s a lot of commotion; it wouldn’t be surprising if some of the kids were frightened; it wouldn’t even be surprising if some parents inferred that some of the yelling was directed at their offspring. But there is just no evidence, certainly not in this video, that the protesters were harassing ANYONE. Seeing is believing, they say. But nowadays, it’s much more common for hearing to be believing in spite of what one has seen to the contrary, particularly if something is heard often enough. Viewers of this video have been entirely willing to discard the evidence their own eyes have seen, or not seen, and accept what the interpreters tell them they’ve seen instead. Notice the loaded words used to describe the scenario: gauntlet, nervous, fears, overwhelmed, etc. All under the banner of the leading question “How far is too far?” At one point a putative journalist talks to a four-year-old about the incident, and he comments that it was like a parade. Wow, he really must have been terrified; we all know how traumatized kids are by parades. But then the interviewer prompts him to categorize it as scary, and of course he complies. At another point, she (the “journalist”) tells us that we’re witnessing a protester following a parent and child halfway down the block, obviously with sinister intent. But in the video, you’ll see that the man in question evidently is trying to catch up to them and walk BESIDE them, clearly wanting to just talk to them about something. He is armed only with a camera, not a Teabag rifle, and makes no menacing gestures whatsoever. In fact, when somebody yells at him to back off, he promptly does so and holds up his hand to suggest that he meant no harm. The media, however, tell us what to believe we’ve seen. And most people comply. Having said all of this, we must acknowledge that indeed Occupy events have been more unruly than Tea events. It would be pretty hard to deny that. Trouble is, virtually nobody is asking why. Because everyone appears to know the answer already: folks who sleep in city parks are just lower on the evolutionary scale than folks who carry signs about “Niggers” and “white slavery”. Seeking any other explanation, though it wouldn’t require much exertion at all, might border on the scary variety of investigation and analysis that used to fall under the heading of journalism. Previous Communists, Socialists, Marxists, Oh My! The father who was “followed” in the video is the same one who earlier commented that the protesters were terrorists for supposedly yelling at the kids. And the man who “followed” him can be seen behind him in that segment trying to get in a word but being held back. Perhaps he just wanted to clear up that comment – to ask why he was being called a terrorist. In any case, he shows no malicious intent whatsoever; it’s the father who’s displaying all the hostility. Actually, I wouldn’t even conclude from this video that the fellow in question was part of the demonstration at all. But the “journalist” says he was so that settles it, eh?